Today is Saturday, I’m working on most Saturdays. Having a Saturday off is precious, it is a great day to spend time with my family and friends. We went to Deus Cafe. 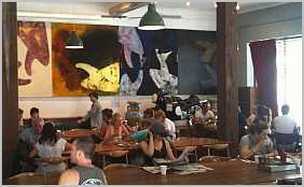 The cafe is located on a busy road at inner west of the city, it has an interesting setting. Part of the premises is full of shinning motorbikes and bicycles. The other part of the premise is setted up for cafe. There were lot of people there, the energy flow in the cafe was positive. Looking at people meandering around the bikes chatting, and lot of cars slowly passing on the road, it reminded me a Chinese word: ‘车水马流che shui ma liu’, translates to English as: car water, horse stream. In feng shui, the car and bikes relate to moving energy, they like water. In modern days horses are no longer one of the major transport, they are replaced by cars and bikes. No wonder the motorbike cafe has good business!